MotorsportReg.com credits are a treasurer's best friend. Rather than taking the time to write and mail a refund check, or worse, refund to a credit card and take another hit in fees from Visa or MasterCard, an in-system credit is just like monopoly money that an attendee can use like cash towards a future registration. The benefit of these credits is the ways in which they can be limited to restrict redemption. Since it's rare that an organization wants a credit to stay on their books indefinitely, these controls support a wide variety of cancellation policies as suggested by the screen shot to the left and a credit is always limited to the organization who created it. Plus, credits roll their balance forward if they aren't fully redeemed eliminating manual book keeping. Credits automatically flow into the event financial report for a clear breakdown of who paid and how, alongside online payment, offline payments and discounts. 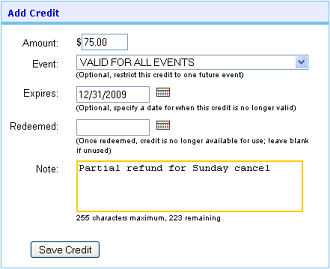 While this information has always been available to organizers, there was only one point when the attendee could see their credit, on the payment screen. Starting today, we're now listing these credits under the My Account tab. While this doesn't introduce a radical new capability, it does provide peace of mind for the attendee when they can see the credit listed and it will eliminate a small, but constant number of inquiries to you and us. You can point your members to look under their "My Account" tab going forward.